Freedome is easy-to-use and supports up to seven devices, but it's also distinctly short on power and features. For beginners and F-Secure fans only. Freedome is a flexible and easy-to-use VPN from the Helsinki-based security vendor F-Secure. The service mostly focuses on the privacy fundamentals. It offers a small set of 29 locations (16 in Europe, nine in North America, three in Asia, one in Australia), with native Windows, Mac, iOS and Android apps, giving you access to (some) geo-blocked content and with no bandwidth limits to hold you back. Although Freedome uses OpenVPN underneath, it doesn't support manually setting up the service with routers or other devices. You must use the official apps. The only significant bonus feature is tracker blocking, although F-Secure does its best to build this up, highlighting extras like an "interactive visual map" to show you the trackers it has blocked. This looks pretty and can sometimes be useful, but realistically, you wouldn't miss it if it wasn't there. F-Secure Freedome VPN isn't available as a monthly plan, but the annual options are reasonably priced. You can protect three devices for an equivalent £3.33 ($4.33) a month, while covering five devices costs £4.17 ($5.42), and seven devices runs to £4.83 ($6.29). The 30-day trial is another service highlight – just install and go, no registration or payment details required – and even once you've signed up, you're protected by a 30-day money-back guarantee. This starts right at the top of the document, with simple statements of policy: "We do not share nor sell any of your traffic"; "We do not read your traffic"; "We do not know what traffic is yours." The page details some logging, including records of "the device ID and the public IP address from where the VPN client connects to our service", the duration of a session and the amount of bandwidth used. But it also explains the purpose of this (to protect against fraudulent use), how long the logs are kept (90 days), and points out that there's no way to identify what you did once you'd connected to the server. Put it all together and F-Secure seems to be making a real effort to ensure its customers understand any privacy issues, and other companies could learn a lot from this approach. Freedome offers an unrestricted 30-day free trial, which is much better than almost anyone else. You must register to get it, but that doesn't require much more than handing over your name and email address, which is much the same as many other companies. Installation is handled via F-Secure's website account. It offered us links to apps for desktops, tablets or mobiles, so we chose the Windows option. Setup was ultra-easy with no hassles at all. Freedome's Windows client is bulkier than most others thanks to a button-packed sidebar, with options including Browsing Protection, Tracking Protection, Tracker Mapper, Settings and Subscription. Fortunately, the core of the program is very familiar. A main console displays your connection status and a few stats (bandwidth used, sites and tracking attempts blocked), and you're able to choose your preferred location and connect with a click. This looks good and is easy-to-use, but there's no real power or extra VPN-related functionality here. There are no server load or ping time figures, there's no way to sort locations or filter them, and no favorites system to save commonly used locations for speedy access at a later date. The Settings options you get also only cover the basics. The client has a kill switch to block your internet connection if the VPN drops, and you can have it automatically launch and connect when Windows starts, but that's essentially it. You can't choose specific networks you'd like to protect, or change your protocol, or make low-level OpenVPN tweaks, or do anything else faintly clever or advanced. You do get F-Secure's blocking of malicious sites, trackers and more, of course, and if you don't have that already, it's a worthwhile feature. It's available on the Android app, too, which is just as user-friendly as its desktop cousin, and at the time of writing has a decent 4.3 rating on Google Play. F-Secure claims that Freedome can help you bypass geo-blocking, enabling access to content you might not otherwise be able to see. We didn't want to take the company's word for it, though, and ran a few small tests of our own. BBC iPlayer has some VPN blocking defenses, and Freedome's single UK location made us wonder how effective it would be. But it was enough to get us in, and we were able to stream iPlayer content without any issues. US YouTube is much easier to view, but it was still good to see Freedome give us access on all its servers. What we couldn't do was watch US Netflix, unfortunately. The platform's VPN blocking technologies recognized Freedome, and we got the standard 'proxy detected' error whatever we tried. 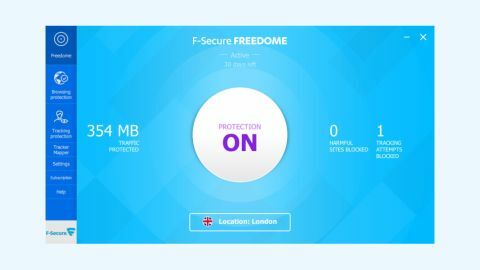 F-Secure Freedome took fractionally longer than usual to make most of its connections, and initial download speeds seemed a little below average. Our local UK server managed 50-55Mbps on our test 75Mbps line, for instance, perhaps 10-15% below most of the competition. The picture improved as we tried more distant European servers. While other VPNs might see performance drop significantly, Freedome proved surprisingly consistent, so for example Poland also delivered a very acceptable 45-55Mbps. Speeds did begin to tail off when connecting to the US, with downloads ranging from 30-40Mbps, but they were always very usable. Only when we went long-distance did F-Secure begin to falter, with Singapore managing 15-20Mbps and Australia struggling to reach 10Mbps. Freedome is a hassle-free VPN which could be a good basic choice for the VPN novice. Experts will be frustrated by the lack of configuration options, though, and the inability to use the service on routers or with anything other than the official apps.